Being Retro: 'My Favorite Martian' Bloghop and Me! 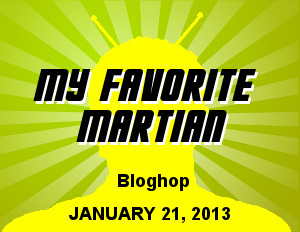 'My Favorite Martian' Bloghop and Me! About the film: Dr. Cal Meacham, a noted scientist, receives an unusual substitute for electronic condensers that he ordered. Instead, he receives instructions and parts to build a complex communication device called an interocitor. Although neither Meacham nor his assistant Joe Wilson have heard of the device, they immediately begin construction. When finished, a mysterious man named Exeter appears on the interocitor's screen and tells Meacham he has passed the test. His ability to build the interocitor demonstrates that he is gifted enough to be part of Exeter's special research project. I know it looks like a upside down ball-sack... well maybe you didn't see it that way, oh well now you do. Please stop over and visit the others, see who they have chosen to be their favorites. Thank you... "THE GEEK TWINS"
I grew up watching movies like this, and I've seen this one many times! Great pick! And yes, I see this one as an upside down ballsack. I haven't seen the movie, but I like the Mutant a lot. Thanks for sharing it with us. "Self-cleaning Mutant, Leaves only the fresh scent of pine." Wait, sorry - that's from the MST3K version. This is great! I love Mutant. And very nicely written - makes me want to see the film again (not seen it in donkeys years!) The trailer is top notch! Thanks for sharing this! Some of those old movies are something else. The acting and technology don't always age well, but at the time they were quite scary. It's kind of like Classic Star Trek. Their tech at the time was cutting edge. But we've advanced so much (at least cinematically) that it looks hoaky now. You know, despite the cheesy costume of The Mutant, This Island Earth actually had some great special effects for its time. All those explosions and ray beams look pretty nice for the era! Nice! Very creepy looking! I like him! :D My Blogfest Post. Interesting seeing the choices people made for favorites that I've not watched or read. That is a good movie. I enjoyed it. Great choice, and I love the blog! Hilarious pics Jeremy. Good choice too. "I never Metaluna I didn't like." MST3K quote. Glad to have you aboard the bloghop! 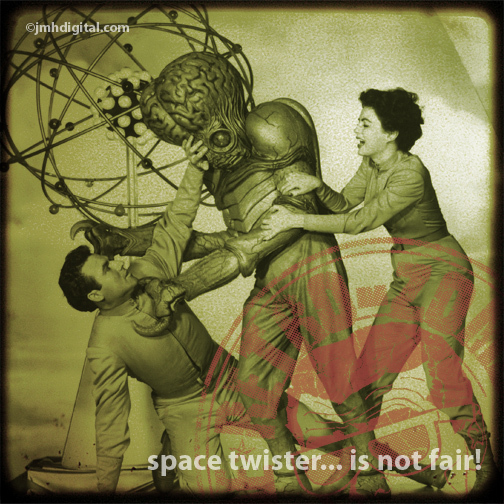 Saying hello from the blogfest...I haven't seen the movie, but that picture of "space twister" is pretty funny. I'd imagine it can get awkward playing twister with an alien. I sometimes wonder what my life would be like if I grew up watching cheesy movies like this rather than Disney and John Wayne. And Star Trek. Lots and lots of Star Trek. Also, Star Wars. Fantastic choice Jeremy! I love this movie a lot - and the Metaluna Mutant (a $40,000 suit back when that was SERIOUS money) was always one of my very favorite alien creatures ever! Top marks and cheers! High fives on the pic! I loved this movie and it is a great extra-terrestrial. There's something awesome about those old classic sci fi films. My dad and I used to watch them together all the time. Upside down ball sac? Yes, that's the perfect description! ;) I love the look of this sort of old movie. A to Z Challenge ... Is Coming... HELP! Favorite Bro Codes for YOU? What the WORLD needs now is LOVE! Announcing the Official Blogging A-Z Co-Hosts! What is WORSE than a MONKEY on your Back? So These are MY toys... Can you name them? So For Me... COUGARTOWN is... Funny! Where... Do We... Go From Here?